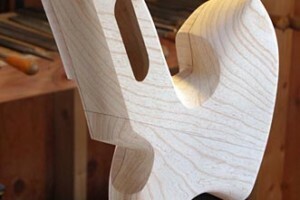 This week, we’re wrapping up the series on the making of Orchid, an in-depth look at the build process for a custom bass for No Treble’s founder, Corey Brown, by luthier Rick Toone. If you missed the earlier part of the series, check out Part 1, Part 2 and Part 3. Sculpting the body is one of the most enjoyable aspects of building. I love to tear into a solid blank with gouges, rasps, files, and increasingly finer grits of sandpaper, eliminating unessential mass and matching contours of the instrument body to the human body. Considerable thought is invested in observing, then adjusting, how we interact. Traditional hand tools are efficient for these varied topographies. Access plates, pickup bezels (as needed), and endpin jacks are fabricated from stainless steel. I also work with copper, bronze, brass, titanium, or aluminum. 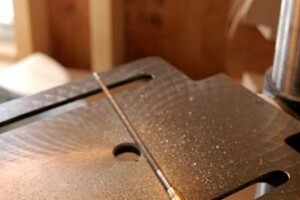 Surfaces can be finished smooth or blacksmithed into organic textures. 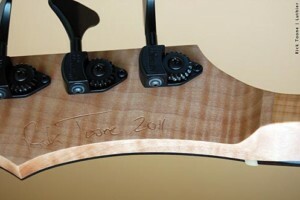 Corey’s bass receives sleek contemporary metalwork which begins with template and raw stainless. Secure protection from water, temperature change, and impact is provided for your instrument by a fitted gigbag. Handsewn in Boulder, Colorado, USA by Altieri. Convenient (stowable) shoulder straps convert to a backpack for metro or mountain bike commutes to the studio. Construction methods are identical to backpacking/rock climbing equipment. Custom purple quilted ripstop nylon cradles the finish. Volara hydrophobic closed cell foam padding protects against bumps and drops. 420 Denier Pack Cloth with polyurethane coating is waterproof and designed to handle abrasion. YKK zippers and double stitching throughout. Throughout the design and build process, we collaborate via email, phone, photos and templates. I have successfully designed instruments for musicians located around the globe, by these methods: Thailand, Sweden, Mexico, as well as the US. Sometimes, depending on proximity, we can also meet in person. Working with Corey has been fortunate, because we are within a day’s drive of each other, allowing for visits. When both basses — 32″ & 34″ — were assembled but not yet finished, Corey traveled to the shop for an opportunity to test play them both and decide which he preferred. Tonal performance between the two scale lengths is nearly identical, with 32″ medium scale exhibiting slightly warmer rounded tones in upper registers, and 34″ long scale exhibiting slightly deeper fundamentals and upper midrange twang. Sustain, punch, and clarity are identical. Corey felt more comfortable with the familiar 34″ scale length. 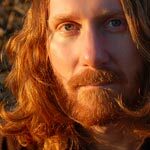 He is an experienced bassist, with 30+ years of fretboard time, and he accurately predicted his choice in advance. While at the shop, we evaluated how the body contours of the instrument fit him. I made notes and a few subtle adjustments to relieve pressure points. 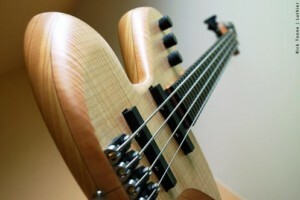 Our objective is to have the bass wear comfortable like a shirt, seated or standing, without needing to adjust posture to play. Originally, Corey was seeking a dark stained finish, like an upright bass. 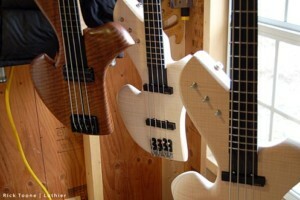 After visiting the shop, and seeing the unfinished instrument, he decided he loved the natural wood color even more. 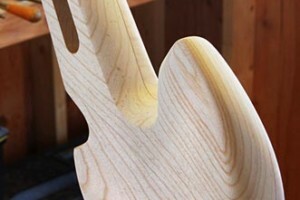 Excellent choice, given the beauty of the curly maple. I prepared the wood surface using a multi-step method that begins with raising the wood grain then sanding the fibers flush using increasingly finer successive abrasive grits. Repeating this process several times creates a surface that is extremely smooth. Permalyn is applied liberally, soaking into the surface, until it would no longer absorb. Finish penetrates the wood, deep into pores, forming a water and alcohol proof barrier that protects the wood from moisture and subsequent dimensional changes due to seasons. Building on that base coat, additional coats are applied, wiped and hand polished. Final surface finish is microcrystalline Renaissance wax. The result is exceptionally durable, a finish designed for gunstocks and harsh weather exposure, yet with a surface that is inviting to touch, with all the organic beauty of wood. beautiful craftsman ship but I’m not sure about that top front bout. i wouldn’t want my controles there. then again ts not my bass.